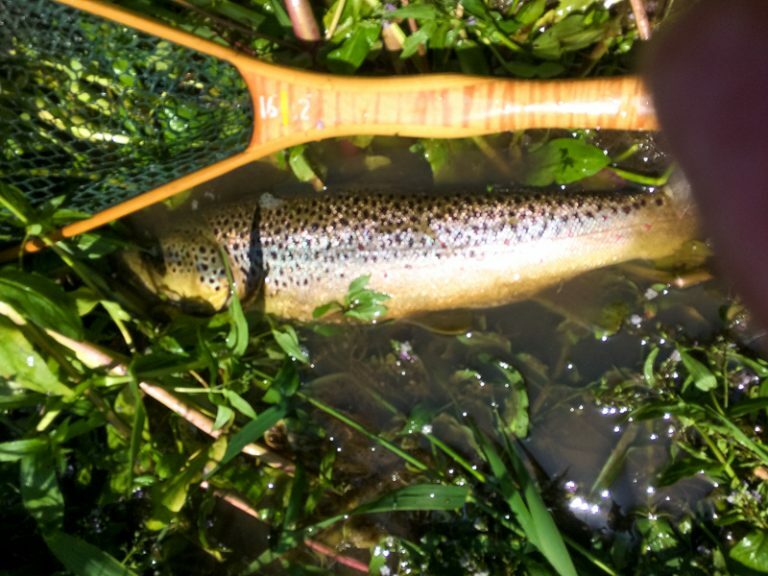 To catch one big fish in the Frome may be considered fortunate, but to catch a brace the same size on the same day borders on the miraculous. The first was in the morning on a carrier, in a difficult place (aren’t they always ? ), but I saw it in a shaft of sunlight, nicely balanced just under the surface very quietly sipping flies as they slid past. I could hardly believe my eyes. One of the famously big ones that I had heard about but never quite believed. I like to fish that river fine and far off, particularly in a breeze which makes everything just a bit harder and more fun. The fish are always very wild, so it is first cast or nothing. It took a small parachute Adams, and then just swam quite slowly and steadily round and round it’s own pool, as if it didn’t really believe it had been hooked, with me, heart in mouth, applying as much pressure as I thought a 7X cast could stand. This went on for quite some time and my wrist was getting more tired than the fish. Eventually I netted it and measured it carefully at 21 inches before putting it back, when it swam away apparently unconcerned. By far the biggest fish I have caught this year. The second was in the late evening on the same day. It was feeding spectacularly all around the tail of the pool, smashing at spent mayfly in an apparent frenzy and sending swirling ripples from bank to bank. The difficult bit was to judge which way it was travelling in between bites. If I could put the fly anywhere near it would certainly take. It took a big detached body Mayfly and gave a wonderful aerial display all around the weir pool, worthy of a Marlin, with me just hanging on and wondering how I was going to land it, given that I was casting from the wrong side of the fence. Eventually it calmed down and I could climb the fence one-handed to get into the water. It measured 22 inches and was definitely exhausted after all the leaping and whizzing around the pool. I propped it upright between some weed and my net, and it took five minutes to recover and swim slowly away, shaking its head. No photo. I had forgotten to take the iphone.